The invention improves spiritual care and can reduce anxiety in ventilated intensive care patients. 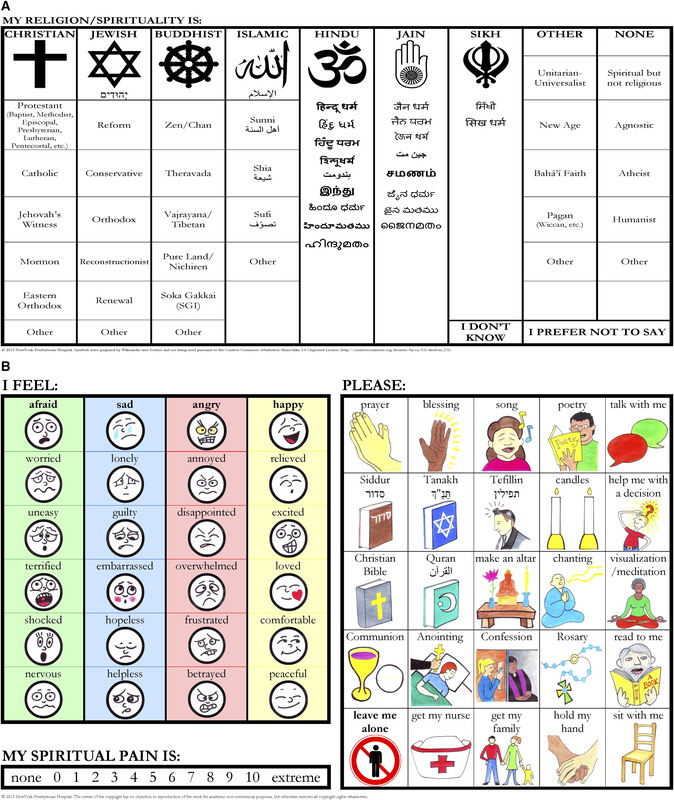 A new spiritual care communication board is helping patients in the intensive care unit (ICU) communicate their emotional and spiritual needs. The board, created by the Pastoral Care & Education Department at NewYork-Presbyterian/Columbia University Medical Center, is now available to hospitals and healthcare systems across the country. The board displays words and illustrations that allow mechanically ventilated patients to indicate their preferences for spiritual care. Working with a chaplain, patients point to the words or illustrations that indicate their spiritual or religious affiliation, emotional state, spiritual needs and desired chaplain intervention. The overall purpose of the board is to reduce anxiety in patients and ensure they receive the most appropriate spiritual care. Traditional communication boards have been used for more than a decade to help medical personnel obtain critical information from non-vocal patients who are in one of the many phases of ICU care. The boards allow patients who are alert but cannot speak to indicate a number of needs during their stay by pointing to letters, words or pictures in a variety of formats and languages. These clinical communication boards provide immediate feedback from the patient to the care team, providing more effective and focused care, while reducing the communications issues that can sub-optimize the ICU experience. While these clinical communication tools have played an extensive role in improving patient experience, they had never before been used for spiritual care. A recent study in the Annals of the American Thoracic Society (AnnalsATS) led by Chaplain Berning and Dr. Matthew R. Baldwin, attending physician in Critical Care Services at NewYork-Presbyterian/Columbia University Medical Center and assistant professor of medicine at Columbia University Medical Center, found that patients in NewYork-Presbyterian’s ICUs were able to complete the card with a chaplain’s assistance and receive a desired spiritual care intervention in a median time of 18 minutes. Patients reported a mean 31 percent immediate reduction in anxiety after receiving this care for the first time, and those who survived intensive care reported a reduction in stress that they attributed to picture-guided spiritual care. In accordance with established criteria of the Association of Professional Chaplains’ Standards of Practice as well as the authors’ clinical experience, NewYork-Presbyterian’s NYP Ventures arm has worked with Vidatak/Acuity Medical to produce the card in English and Spanish for hospital distribution across the U.S. Author disclosures to the AnnalsATS paper are available within the study.